The Tennessee Tax Free Weekend 2018 starts on Friday, July 27th and ends Sunday, July 29th, 2018. A list of tax-free items and their limits are below. Tennessee Tax Free Weekend 2018 will now be held the last weekend of July. The holiday is held in July and normally starts at 12:01 a.m. on the last Friday in July and ends at 11:59 p.m. on the following Sunday. 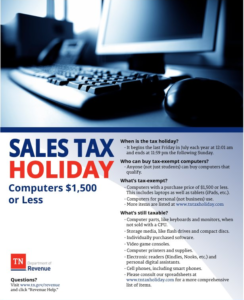 Ballet and Tap Shoes .. Cleated or Spiked Athletic Shoes ..
Computers with a purchase price of $1,500 or less, not for use in a trade or business, are exempt from sales tax. For purposes of this exemption, a computer is defined as a central processing unit (CPU), along with various other components including monitor, keyboard, mouse, cables to connect components, and preloaded software. Some Area Retailers have even extended their hours for shoppers, so make sure to call ahead to your favorite shopping retailer and see if you can get in an extra hour or two of tax free shopping. 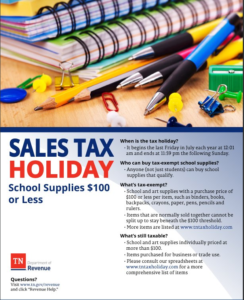 For more information please visit the Tennessee Department of Revenue website. 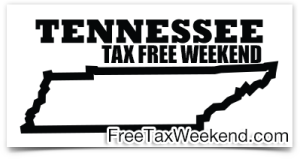 *2017 Update – The Tennessee Tax Free Weekend will now be held the final weekend of July from now on. 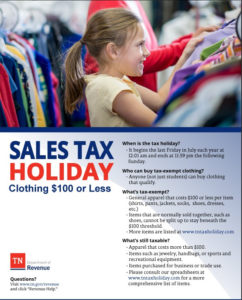 Tennessee General Assembly passed Public Chapter 398 (Tennessee Code Annotated Section 67-6-393) which established an annual sales tax holiday beginning in August of 2006.